Warning: This review necessarily contains spoilers. If you have not read this series and might one day, please don’t read any further! 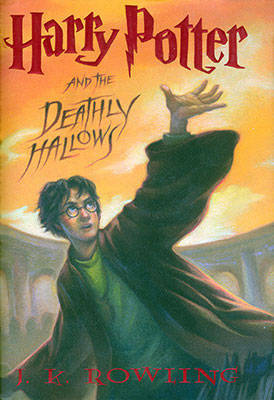 We’ve come to the final installment of my Harry Potter hardback/paperback comparison. It was in finally getting the paperback version of Deathly Hallows last summer that enabled me to start work on this project in the first place. Since the third book in the series, I’ve documented changes made to the text between hardback and paperback printings (the first two didn’t have any changes). So, how did Deathly Hallows compare? Shock. No changes at all. Well, perhaps that’s not true. It’s true to say I found no changes. I also verified the bottoms of each page to make sure they each lined up, so there were no major changes that affected text placement. If there were little word changes that didn’t alter the pages, I’m afraid in the case of Deathly Hallows, I didn’t catch them. I’m fully aware that this is my own fault: I haven’t read the book nearly as often as the others in the series (~10 as opposed to ~25), so I don’t have the book as memorized as the others. Whereas in the other books, I will notice word differences because I’ve read them all long enough to know exactly what the phrasing should sound like, I just don’t know Deathly Hallows to that degree. So there may have been changes I missed. However, there weren’t any major changes. This was disappointing, actually, because Deathly Hallows is riddled with errors and inconsistencies, far more than in any other book in the series. Suddenly polyjuice potion doesn’t have to be taken every hour, but instead lasts longer if you take more at one time. How in the world is Snape talking to Dumbledore’s portrait in the summer, well before he’s appointed Headmaster by V? Wouldn’t the other teachers have seen him and get him arrested/captured? And while we’re on that subject, how does V expect Snape to continue to be well-informed after he kills Dumbledore and the Order thinks he’s a double-crosser? Wouldn’t V expect Snape to no longer be so well-informed? The fact that Snape is still bringing in information from the Order ought to be very suspicious to V.
The time the Potters spent in Godric’s Hollow under the Fidelius Charm is inconsistent with what’s been said in previous books. They apparently spent months there, considering Lily sent Sirius a letter right after Harry’s birthday (July 31) and V doesn’t kill them until Halloween. Harry even speculates that this is the last time Wormtail might have seen the Potters – but if that’s true, why did it take V 3 months to attack? Besides, in previous books, it said the attack came barely a week after the Fidelius Charm was performed. There’s also an inconsistency in the time between the deaths of Dumbledore’s mother and sister. Most of the book seems to place it around a few months over the summer, with Mom dying at the end of the school year and Sis dying right before school began. Still, at the same time Elphias Doge says that in that time, he took the traditional year-long around the world trip. He says Sis died at the end of that year, and states he was at both funerals, but also states he completed his year’s journey. The potion in the cave where the locket is kept shouldn’t have been there when Dumbledore and Harry journeyed there at the end of Half Blood Prince. Regulus drank it when he slipped the fake horcrux in there. It’s not a self-replicating potion, because when V tested it with Kreacher, he had to pour more in manually. It never says Regulus poured more in, and even if he did, Dumbledore and Harry certainly didn’t. And yet, when V goes to check on his locket, the text says he stares down at the bowl whose contents have turned clear and sees no locket under the surface. V puts a taboo/jinx on his name, so that anytime anyone says it, it removes all protection around the person who said it and causes a disturbance so the Death Eaters know where to find them. That allows the Death Eaters to find Harry right after the wedding and then later in the woods. However, both Harry and Hermione say “Voldemort” multiple times while they’re living in Grimmauld Place, while the jinx was already in place. However, they are still protected and the Death Eaters don’t know where they’re at. Why?? That doesn’t make sense! When they evacuate Hogwarts, they send the kids into the Hog’s Head to disapparate out of the bar. However, Aberforth already said it’s impossible to apparate out of Hogsmeade at that time, plus many of those kids are well below 17 and don’t know how to apparate. On page 737, Harry tells V that one of them is about to leave for good (during their last battle). V says, “One of us? You think it will be you, do you, the boy who has survived by accident, and because Dumbledore was pulling the strings?” Maybe I’m just missing something, but it seems like this sentence is all wrong. Why would V think that Harry would think Harry’s the one about to die? Why would he be jeering and laughing at him for thinking that? After three years of reading this book, I still can’t figure out what V is trying to say here…it makes me think Harry was supposed to say one of them was about to stay for good or something. I knew some of these wouldn’t get fixed – plot developments depended on them – but I hoped at least some would get cleared up in the paperback version! These errors/inconsistencies, as well as that awful King’s Cross chapter where we all sit down to let Dumbledore explain everything that we couldn’t figure out, take a book that might otherwise be a favorite of mine and make it just meh. It’s the middle-liked book for me – I like books 3, 5, and 6 more, while liking 1, 2, and 4 less. That’s too bad, because otherwise Deathly Hallows is a beautiful and well-written book! The Prince’s Tale is my favorite chapter in the whole series, and Bathilda’s Secret is in my opinion the creepiest chapter of the whole series. I was hoping the paperback version would clear some things up, but I guess now that we were at the last volume, they decided not to make any changes this time around. This entry was posted in 2008, 2009, 2010, 2012, Children's, Prose and tagged Harry Potter, humor, memorable, multi-read, reread, speculative. Bookmark the permalink.